Honored! I admit I was surprised this book was released now, versus after IX, yet it is obvious it is an important project (and message) for LF and KK, so here it is, and I have no complaints! But, they have the IX quandary because of reylo and bendemption. I realized as I read the entries, regardless of what happens in IX, they are timeless present, plus a wink of spoilers..lol...so the book remains collectible valuable. Wow everyone ! This is wonderful and very promising! I just had notification from amazon that my copy has been posted through my letterbox - if I find anything else when I have a look through it when I get home tonight I will post on here . Can someone clarify something for me in regards to Leia in the next film, because this reminds me of a comment I saw on another forum. J.J. revealed that he would be using unaired footage from TFA in order to have Leia in IX, correct? But the thing is, beyond that, he didn't give any context for how he's going to use that footage, right? I saw someone mention somewhere else that someone's "leaks" couldn't be correct because they said that Leia was dead in IX, but we know from J.J. that she's going to be alive... thing is, we don't actually know that, do we? Because to me J.J. revealing that Leia is going to be in IX via previous footage might just be a coy way of saying she's going to be in it via flashback, though she could technically be dead by the time the film begins. But we don't actually know. Right? Just wondering if I have the right impression of what we do/don't know. @nickandnora wrote: Can someone clarify something for me in regards to Leia in the next film, because this reminds me of a comment I saw on another forum. So, it can be either way (flashbacks, or Leia is alive in the scene).....or both...there are more unknowns than knowns at the moment about this. Unfortunately, clarification is technically not currently possible. "Buoyed by her hope, Leia keeps going even in the darkest of times. It's who she is. It's devastating, and the first time we've seen the unflappable Leia Organa waiver, when she says toward the end of The Last Jedi, 'The galaxy has lost all its hope. The spark is out.' But she does not break, the tide of the battle turns, and Leia rallies the remaining Resistance forces to fight another day. Hope always remains." That's what I thought, that basically anything is game and J.J.'s admission that they will be using previous footage of Carrie doesn't tell us anything one way or other, especially considering: a) J.J. hates spoilers and loves misdirection, and b) J.J. loves flashbacks (meaning they're always going to be a possibility). I was just confused as to why this one poster on reddit was so emphatic that we know Leia will be alive in IX. I mean, she might be (but to be honest I think it would still be incredibly difficult to do this justice with found footage), but she might not be. @SW_Heroine_Journey That last line is golden: Hope always remains. "Skywalker saga without her eluded us. We were never going to recast, or use a CG character. We have found a way to honor our daughter, Billie, we have found a way to honor Carrie's legacy and role as Leia in Episode IX by using an unseen footage we shot together in Episode VII. " @Teo oswald wrote: "Skywalker saga without her eluded us. We were never going to recast, or use a CG character. We have found a way to honor our daughter, Billie, we have found a way to honor Carrie's legacy and role as Leia in Episode IX by using an unseen footage we shot together in Episode VII. " I would love it if their means of connecting would be via the World Between Worlds, in that she most probably would have passed away, but Ben would find himself there and would be able to connect with her prior to her passing as Leia's passing would be a monumental moment in the universe, I feel. Not sure if this goes here, but what is these news of Kylo getting a new super weapon or lightsaber? Is it a crack spoiler? Anyone knows? I am reading this on some online sites and wanted to know if it was true or not. Rumored scene that Kylo has a vision of Anakin right before he is put in the suit and becomes Darth Vader. I could see this as a major moment that makes Ben rethink holding up his grandfather's legacy, due to the pain and anguish it caused him. Part of me hopes this or some variation of the scene makes it into the movie. It would be nice to see Solo interact with Anakin in some capacity. Got it. Thanks so much. Why do people still believe everything he says in his videos? Drives me crazy. Richard E. Grant joined Josh Horowitz on his podcast Happy Sad Confused and spoke a bit about Star Wars: Episode IX. J: Wait, do I have this right—did you not even know you were up for a Star Wars movie when you kind of like put yourself out there for this? R: I got sent a 10-page generic sort of, I think, it was an interrogation scene clearly from a 1940s British B picture because the references were not Star Wars and the language was something that my grandfather would have spoken in and I thought, you know, the three contrasting scenes that you were supposed to show as much versatility you could muster in a self-taping situation. So I did that and sent it off and it goes into cyberspace and you don’t even think about it again because it’s what actors, you know, what you do all the time, you audition, send stuff out and never hear [back]. And at this point the room went upside-down and I’m sure he was telling me in detail what part I was playing and what the character is called. I have no memory of that whatsoever. I just kept thinking: I might be in Star Wars. @kroi wrote: Richard E. Grant joined Josh Horowitz on his podcast Happy Sad Confused and spoke a bit about Star Wars: Episode IX. That's interesting that Daisy was in that meeting with REG. I wonder if that's an indication that they'll be sharing scenes together. It's even more interesting if it means anything that REG was sent an interrogation scene to audition with. My thoughts immediately went to Tarkin while reading about the movies from 1940 and grandfather lines. Not that I think REG would play resurrected Tarkin (LOL), but the type of old fashioned FO officer (maybe some old Imperial officer who joined the FO) isn't out of the possibility. I'm thinking he's either a villain type or a mentor-type character who helps Rey on her journey. After all, we already had one heroine-villain interrogation scene. Unless they want to do another to contrast it to the Reylo one. But idk. THanks so much for sharing this kroi! very interesting indeed! An interrogation scene with a 1940s vibe - super interesting!! What I found most interesting here is : what's the other two scenes he had to audition with? That he mentions the interrogation scene may mean it's not super relevant.. and the other two scenes which he doesn't describe are..
Of course, it may mean nothing but I'm super curious to hear about these other two scenes. Thanks for posting this Kroi. Yes I wonder too what the other two scenes are ? Definitely sounds like he’s sharing scenes with Daisy though . Maybe he is first order and interrogating Rey or maybe resistance interrogating someone first order and rey is present as the force user ( like a reverse interrogation scene from TFA)? I have a feeling the other two scenes he mentions may be too spoilery so maybe that’s why he only mentioned this one . Very interesting. Domnhall spotted in Dublin and he has a thick beard. If we remember back in Aug when he was doing his Little Stranger promo, he had no beard and was talking about being on the SW set “yesterday”. 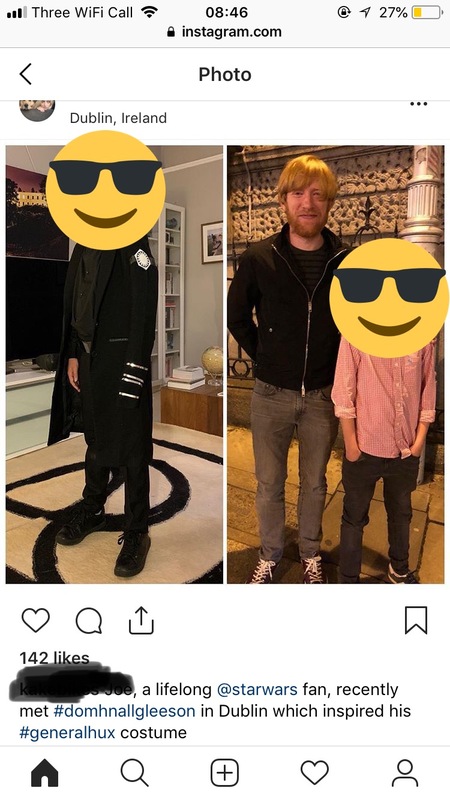 So does this mean Domhnall hasnt been filming at all, or will be filming his scenes soon? So We know Adam has been filming so i guess we can speculate that Adam has not been filming with Domhnall recently hmm. I have a feeling that Domhnall hasn't been filming since September . This was him in mid September, and you can already see that he's starting to let his facial hair grow out. Granted, it's easy for one to shave and regrow a beard, so it's not really a solid indicator of anything -- but he has also been spotted pretty consistently in Dublin since then. If he did do some filming, it would have been very short. If he hasn't wrapped already, he's probably waiting for Adam to finish up campaigning for Blackkkklansman to film the rest of his scenes. Q: What’s interesting to you about playing Kylo Ren? Adam: That’s hard to say because we’re working toward something in particular with that character. I don’t want to give anything away. Q: There are very few people in the world who can see the ways in which a large number of other people view them. But celebrities can. So does seeing what people pick up on — whether it’s being considered attractive or intense — incur any particular self-reflection? Adam: Being an “intense” actor, I don’t understand what that means. That I show up on set and glare at people? That before every scene I’m like, “I need to fire off a rocket really quick and then I’ll come back and act.” That I carry around cold cuts that I smash before every scene? Adam: [Laughs.] Only on Paterson. I don’t think of myself as an intense person. If what I’m doing is so abnormal that it’s intense — yeah, I have no idea. I’m not a method actor. I like to stay focused on set but it’s not because I have a process that I’m imposing on everybody else. Sometimes you have to be more focused in between scenes because what’s happening is that, on something like Star Wars, it’s pure comedy in between takes. It’s stormtroopers running into walls because they can’t see through their helmets. So I don’t know where the intense thing came from. That’s super interesting Riri - thanks for finding this . Wow ! So it’s like a comedy set on Star Wars and he’s doesn’t see himself as intense or a method actor ? That’s very interesting because we were led to believe the opposite before ie Adam staying in character most of the time due to being a method actor and Intensity of kylo as a character . I wonder if this is part of the marketing ploy to lighten the mood of what goes on set and his character and this is the truth as to how it’s always been on set . I always had my suspicions that those rumours of him being broody etc on set were fabrications because you’ve only got to look how smiley he is behind the scenes TLJ in his tie silencer , when daisy looks at him laughing on her knees and he shows her the lightsaber ( no doubt they were sharing a joke ), the fact Rian Johnson said Adam had a great sense of humour and that they all went out drinking and for meals etc . They’ve tried to hide away Adam a lot in the behind the scenes reels ( focussing on Oscar and John ) and I think it’s been deliberate in keeping in line with the mystery of kylo as a character . Now maybe the tide is turning and the truth is coming out because kylo’s character is heading to the light big time . Either that or Adam is a lot more comfortable with his Star Wars family now as he’s on his third film with them. That was a really long but fantastic interview. Print interview with Adam always tend to be the best. He really does tell it like it is re: showbusiness integrity and he gets pretty existential in this interview at times haha. What I find most interesting about his answer about Kylo despite not being able to give anything away is that it implies that the things he finds most fascinating about him we haven’t seen on screen yet. @AhsokaTano That whole method acting/serious persona thing surrounding Adam was always exaggerated tbh. Most of it didn’t even originate from himself. He had to debunk that rumour about turning down lunch with Mark Hamill as it wasn’t true. We know he pranks people on set and Rian said he was the funniest. But yeah, it is interesting from a PR standpoint. Especially with what it bodes for Kylo’s character as LFL is very conscious about these things (see Wreck it Ralph’s Kylo joke).